When (Old) Portsmouth was fully fortified, Point was surrounded by the sea (although, admittedly, it was only cut off from the rest of Portsmouth by what was, in effect, a moat at the top of Broad Street). It is not surprising, therefore, that the economy of the area should be highly dependent on the sea and boats. At that time the Camber was only a small haven and access from the sea must have been very limited and subject to the state of the tide. Eventually, when it was dredged the Camber became more viable as a commercial port. However, for many years it has been home to a fleet of fishing boats and, later, to pleasure craft also. 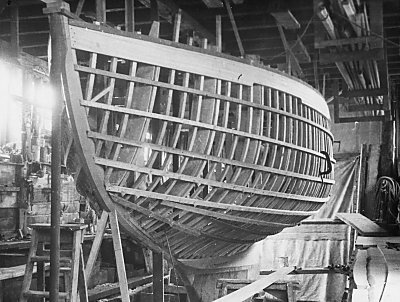 Associated with these uses, a small number of boat-builders were established and flourished in the early and mid 20th century. The firms that I can remember were A.W. Clemens who had a workshop with access to the Camber (near Seager's Court), Harry Feltham whose premises were in West Street and George Feltham (G.A. Feltham & Sons) who was at 4 Broad Street with his workshop behind the house at the top of the inner Camber. George and Harry were brothers and sons of a boat-builder, John Dawson Feltham, who operated from premises in Bath Square next to the Custom House (now subsumed into the Still and West). After Harry's death his nephew, Stan, took over the business operating in later years from a workshop in Bath Square. George Feltham was my grandfather and my father worked for him. I spent much of my childhood and teenage years in his workshop making model boats etc from scrap wood. The house and workshop are still in existence, although much altered. The boats at that time were built of wood, the use of GRP (Fibreglass moulding) only coming into prominence in the latter part of the century although George did take on some fitting out and trimming of GRP hulls when work became short in the 1970's. My earliest memories are of 'whalers' being built for the Admiralty during World War 2. These were clinker-built boats designed to be propelled by oars or sails and were 27 ft. long. I can remember them being built in the loft of the workshop and, when complete, being lowered into the water from the gantry which can still be seen projecting above the upper doors overlooking the top of the Camber - an operation which must have been hazardous and would not, I am sure, be acceptable to the Health and Safety Executive today! Larger boats were constructed in the ground floor accommodation where the concrete floor was able to withstand the heavier loads and from which launching was easier although, from my recollection it was never straightforward. It is easy to forget that power tools, which are used for everything these days, were generally not available fifty or more years ago and the majority of the work was done by hand. There was a circular saw for cutting large sections of timber and there was a band saw, powered from the same electric motor by a series of leather belts over flat rimmed drive wheels, for cutting more intricate shapes. Apart from these, most work was done by adze, hand-saw, plane etc, and the hole through the keel for the stern tube for the propeller shaft was drilled using an auger. A very different situation from today when there is a power tool available for most operations! Boat-building at Point gradually faded out. I believe that A.W. Clemens was the first firm to go, apart from J.D. Feltham, of course, who died in 1917. Harry Feltham died while sailing in a Victory boat during an evening race in 1958. (The Victories are the 20 ft. black-hulled boats which still have a strong following in Portsmouth and can be seen regularly racing in the Solent.) George died in 1975 and then his business was closed down and my father retired. Stan carried on for a few years after this but now there are no boat-builders left on Point. The Victory Class boats are based on the old Bembridge Sailing Club one-design class and I understand that both Harry and George were apprentices at Woodnutt and Co at St Helen's on the Isle of Wight and were involved in building some of these boats. The design was modified and adopted by Portsmouth Harbour Racing and Sailing Association in 1934 to form the Victory Class. Both Clemens and Harry built Victory boats but George never did. The class has moved on and the hulls are now being constructed in GRP. One of George's enduring legacies is the Sea View One-Design Dinghy class. These 12 foot long dinghies were based on a boat previously built by George and designed so that they could be left afloat on moorings at Sea View (Isle of Wight). The class was started in 1931 and is still being raced successfully today with nearly 200 boats. In the years after World War 2, George was instrumental in starting another dinghy class known as the Stormalongs which raced as a class and Harry responded by building dinghies designated as Scow-Bows. Owners of these boats raced for a number of years in competition. Of course, dinghies were not the only type of boat to be built at Point. There were also private yachts, motor cruisers, fishing boats etc but they were usually limited in length by the size of the builders' premises or restrictions in launching facilities. Generally up to about 32 feet in length was attainable but anything longer could become a problem. In the 1950's there were a few clients who commissioned new boats of this size. George built three yachts in succession which were all of the same hull design but had different sailing rigs. One of these boats, the Rob Roy built in 1956, was for the Rev. Stephen Packenham who wrote a book describing his experiences. He sailed the boat to America to participate in racing and, bringing her back home, he broke the single-handed trans-Atlantic record completing the voyage in 21 days. This was, of course, before the development of self-steering gear, satellite navigation etc. In 2008 I received an email 'out of the blue' from a Richard Eaton who lives in Derbyshire and has bought the Rob Roy and started restoring her to her original condition - a huge undertaking to a wooden boat over 50 years old. Now that GRP has taken over, building boats in wood is a rarity and the old workshops at Point have either been given over to new housing or been converted to other purposes. In June 2013 Paul Stephens wrote to say that his father, Donald Stephens, bought Rob Roy from The Reverend Stephen Packenham in 1971. They transported her by road and moored her at Hollyhead for 3 years after some refurbishment and painting. Donald sold Rob Roy to the Isle of Man Sea scouts in 1974, probably for use as a training vessel. At the time Donald owned her she had had the inside of her bow strengthened in USA following the battering during the Trans Atlantic race in 1968. Paul went on to say that "She was so graceful on the water and so fast (having 15 sails from storm to 90% Genoas) we could overtake boats that were 'racing' off Hollyhead harbour (much to their displeasure). We mainly sailed to Ireland and around the coast of North Wales but unfortunately never utilized her to her true potential. If, by any chance, Richard Eaton still has her I would love to see her again for old times sake, my father having passed away in 1998."